Now click here to below links and Check your Result. If you like this article please share with your friends via Facebook, Twitter etc. Or Subscribe our Mailing List for More Future Updates at your Mail ID. Best of Luck for Result. Tags: (Declared Today) CMA Final and Inter Result December 2014, CMA Foundation Result December 2014. ICWAI Announced CMA Foundation Result for Dec 2014 exams. Check CMA Result Dec 2014. Click here to check CMA Result December 2014 Exam Result. cma foundation result December 2014, icwa foundation result December 2014, cma foundation results for 21st December 2014 syllabus. 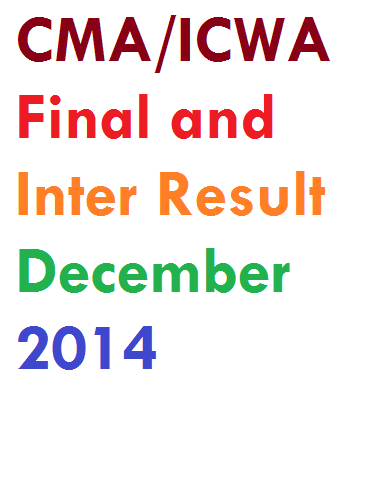 ICWAI/CWA/CMA Result December 2014. Check CMA/CWA/ICMAI Foundation Result Dec 2014 From Below. Frequently Asked Questions for CA Exam Forms May 2015.